Also known simply as PCOS, Polycystic Ovarian Syndrome is a health issue that tends to affect women during their childbearing years. The condition is distinguished by an ovary that is much larger than normal, and is also dotted with cysts all along the exterior. PCOS can negatively impact fertility, and can also help set the stage for the development of a number of other health problems, including diabetes and heart disease. There are several basic symptoms that are found with PCOS. The most common sign is a change in the frequency of the menstrual cycle. If you find that the time frame between each period is getting longer, that may be an indication of the presence of polycystic ovarian syndrome. If those stretches of time reach the point that you are experiencing eight or nine periods each year rather than the normal twelve, there is definitely a good chance you have PCOS. Another common sign is the presence of excessive amounts of androgen in the body. You may find that facial and body hair grow faster and thicker. At the same time, your skin may begin to erupt in a manner similar to the outbreaks of acne you experienced as a teenager. There is even the chance that you may begin to lose hair from the head, much in the same manner than a man may go bald over time. 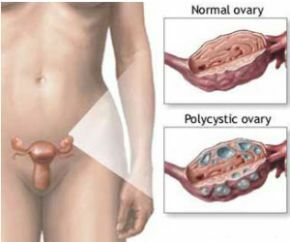 Some women are at a greater risk for developing Polycystic Ovarian Syndrome. 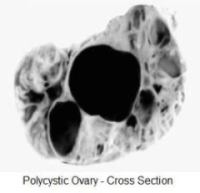 If your body weight is sufficient to be classified as obese, the risk of PCOS is increased. There is also some evidence that women who have sisters or other female blood relatives that have experienced this condition, they have a better chance of also developing PCOS. As your condition worsens, you may find that your cholesterol levels change. You will have higher levels of bad cholesterol while finding that your levels of good cholesterol drop below a normal range. Your blood pressure may begin to rise, and you may find yourself feeling dizzy or sleepy after consuming an excessive amount of carbohydrates. This is because PCOS can contribute to your body failing to process carbohydrates properly, leading to problems with your blood glucose levels. Once you have been diagnosed with Polycystic Ovarian Syndrome, managing your condition with the help of a physician is very important. Regular checkups to monitor your condition, both in terms of the appearance of new health issues due to PCOS and the condition itself, is essential. Your doctor will probably refer you to a nutritionist who can help you reorganize your dietary habits; this is especially true if you are beginning to exhibit signs of blood glucose problems. There is also the chance you will be prescribed medication to help get your menstrual cycle back on track. Keep in mind that PCOS is highly treatable. Dealing with the condition does require making some lifestyle changes and being aware of the development of symptoms related to other health issues that can be triggered by the presence of this disease. However, with proper treatment, there is a good chance you can live free of any symptoms and never develop problems such as heart disease or diabetes as a result of PCOS.